Sustainable Developmental Goal 2 (SDG 2) aims to end hunger, achieve food security and improved nutrition and promote sustainable agriculture. The graph above shows the prevalence of undernutrition as a percentage of the population for the years for African Commonwealth countries for the years 2010 to 2015. Undernutrition (% of the population) is defined as the population below minimum level of dietary energy consumption i.e. the percentage of the population whose food intake is insufficient to meet dietary energy requirements continuously. Data showing as 5 may signify a prevalence of undernourishment below 5%. Out of the 18 nations, Ghana witnessed the highest percentage increase of 41% in the prevalence of undernutrition of 41% from 2010 to 2015 whereas Cameroon observed the undernutrition rate fall by 32% during the same years. 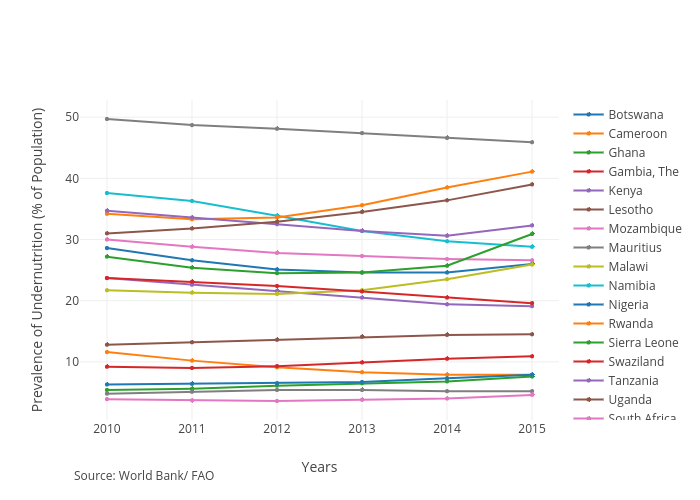 Between 2010 and 2015, the undernutrition rate grew in Ghana, Gambia, Lesotho, Mauritius, Malawi, Nigeria, Rwanda, Sierra Leone, Uganda, and South Africa, while it fell in the others.